A Level 3 crosscut shredder the S-85CC can shred up to 18 sheets at once. With all-metal gearing and special heat-treated steel cutters the shredder is powerful enough to handle paper clips and staples. An extra-wide 16 feed opening and continuous-duty motor for non-stop operation. Features Auto Start/Stop operation, Auto Reverse for anti-jamming and an easy-to-use LED Control Panel with load indicator. 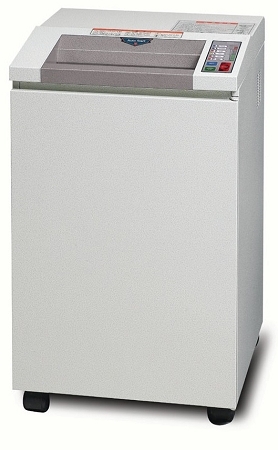 A high-quality all metal cabinet with casters and a high-density lifetime guarantee waste bin.